With the days getting shorter and busier, many of us are looking for extra energy wherever we can get it. 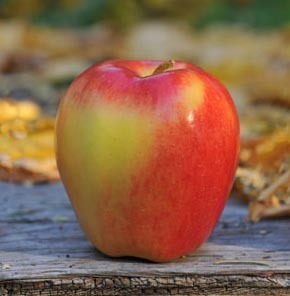 Before you reach for the sugar or caffeine, consider what an Ambrosia apple has to offer. Not all calories are created equal. Calories provide us with energy but some calories do a better job if it. Take for example the 90 – 100 calories found in a medium sized Ambrosia apple. Because these calories are packed with vitamins, carbohydrates and minerals the body gets more out of them. Snacks that are high in calories but low in nutrients give you quick energy but then your body might experience an energy crash. Nutrient-rich calories provide a more sustained energy boost because the calories are metabolized at a steady pace. Digestion effects your energy levels significantly. If your body is working hard to digest food, you tend to feel a bit sluggish. We all know that feeling after eating a big meal; some call it a food coma. We feel this way because our body is putting extra energy into digesting all of that food. Fibre can help the digestive system work more efficiently. When the body doesn’t have to work so hard it leaves more energy for your day to day activities. A medium sized Ambrosia apple has about 4.5 g of fibre which is almost 20% of your daily recommended intact. It’s no secret that drinking water throughout the day is a healthy habit. This is because our body functions best when we are properly hydrated. When we become dehydrated, our body switches into preservation mode and we end up feeling tired and sluggish. Did you know that you can get the benefits of hydration by eating an Ambrosia apple? Apples are actually 84% water! Apples are rich in a variety of vitamins that help give the body energy. In particular, vitamins B1 and B2 which help the body create red blood cells. This boost to red blood cell creation results in higher energy and increased strength. Ambrosia apples also contain a good source of vitamin C which helps convert food stores into energy. Plus, it supports a healthy immune system so that we are less susceptible to getting sick. Ambrosia apples are mineral rich but it’s the potassium and iron that help us feel more energetic. Potassium helps us build muscle and supports heart function; two things that effect how quickly we get fatigued. Iron is needed to avoid anemia, a condition that can contribute to feeling tired and having low energy. In addition to these minerals, apples also have phosphorus, calcium, manganese, magnesium and zinc – all of which contribute to optimal health. Eating an Ambrosia apple for energy isn’t just about the nutrients. There’s a psychological effect to biting into a crisp apple like Ambrosia. Studies have found that the oral sensory input responds to the sound and feel of crunching which triggers the parasympathetic nervous system. Why would you want to activate the parasympathetic nerve system? Because it actually helps the brain wake up and feel more attentive. So, if it’s mental fatigue you’re suffering from, you’ll definitely want to crunch into an Ambrosia! The next time you’re wondering how you’re going to find the energy to make it through the day, skip the coffee and sugary snacks. A single Ambrosia apple will give you the energy boost you need in 5 super healthy ways.